Add 4TB of USB 3.0 cloud storage to your Windows, Mac, iOS, or Android device with the My Cloud Home 4TB 1-Bay Personal Cloud NAS Server from WD. The My Cloud Home provides a one-stop solution for saving digital content, backing up photos and videos on your phone, and wirelessly backing up and syncing your Windows and Mac computers with cloud accounts. This personal storage device plugs directly into your Wi-Fi router using its Gigabit Ethernet port so you can access, upload, and share photos and videos using the My Cloud Home apps for mobile, desktop, and web platforms, as well as stream videos using Plex Media Server. Using the USB 3.0 Type-A port, you'll be able to import photos, videos, music, documents, and more from other devices, such as USB flash drives and external hard drives. This NAS is powered by a 1.4 GHz Realtek RTD1295PB-CG A53 Quad-Core processor and 1GB of DDR3L RAM. It operates on 90-260 VAC at 47-63 Hz and includes an Ethernet cable and an AC adapter. It is compatible with Windows 10, 8.1, 8, and 7, macOS Sierra (10.12), El Capitan (10.11), Yosemite (10.10), iOS 9 and 10, and Android KitKat (4.4), Lollipop (5.x), Marshmallow (6.0), and Nougat (7.x). My Cloud Home storage is home to all your content. With enough space to keep all your photos, videos, and files in one place at home, you can organize it your way and access from almost anywhere with an Internet connection. Set up your My Cloud Home device quickly. Just plug it into your Wi-Fi router. Then, use your mobile device to set up your account and start backing up, accessing, and sharing. No computer is necessary and no monthly fee is required. Use the My Cloud Home mobile app, desktop app, or MyCloud's site to upload, access, and share your favorite memories and stream videos saved on your My Cloud Home device. Quickly import photos and videos from different devices scattered around your house, like USB flash drives and external hard drives, using the USB 3.0 Type-A port on the back of your My Cloud Home. Keep all your favorite moments, action shots, and adventures stored in one central, organized place. Quickly find photos, videos, movies, and docs using a user-friendly search with the My Cloud Home mobile or desktop app, or on MyCloud's site. Invite family and friends to create individual accounts. Each invited person can set up their own private space that only they have access to on the device. They can manage, access, and share their content as they want. Tailor your My Cloud Home device to fit your personal needs and preferences using downloadable services, including Plex Media Server, Dropbox, Google Drive, and more. Cloud services may be modified and vary by country. Store everything in one place, even content in your favorite cloud accounts. Photos, videos, and files from your cloud accounts are automatically downloaded to your My Cloud Home device, including Dropbox, Box, Google Drive, Facebook, and many more. The My Cloud Home device has a 4TB capacity and plugs into your network to wirelessly back up computers at home to one central place. It works seamlessly with Windows Backup and Time Machine software. Stream your personal videos virtually anywhere, on almost any device, using the My Cloud Home mobile and desktop app or MyCloud's site. Collect all your favorite memories and moments in one place. With just a few clicks, share photos, videos, documents, or entire folders with friends and family, so nobody misses a thing. Number of Bays 1 x 3.5"
Box Dimensions (LxWxH) 9.0 x 8.1 x 3.7"
My Cloud Home 4TB 1-Bay Personal Cloud NAS Server (1 x 4TB) is rated 2.4 out of 5 by 9. Rated 1 out of 5 by Jon from Update to: A SERIOUS DOWNGRADE from the older WD My Cloud 4T I returned this My Cloud Home device. I have purchased a My Cloud EX2 Ultra as my new NAS to replace my old My Cloud device. The My Cloud EX series of devices appears to be the upgrade path for previous users of the My Cloud. The EX2 series uses a very similar version of the My Cloud OS as did the old My Cloud device, giving you full control over the device and support for Time Machine Backups. I can highly recommend the EX2 Ultra, but I cannot see any circumstance where someone would want the My Cloud Home device, unless they simply wanted a means of sharing all their information with the world at large. Rated 1 out of 5 by Christine from Beware!! Mostly useless USB connexion You should know before buying this that the USB port, that is supposed to allow you to connect an external drive directly to the My cloud home and access it remotely (which was the selling point for me) only recognizes a very limited number of external drive models. So if you were thinking that you would be able to add to the capability of this NAS, or simply to backup your data faster by connecting directly an external drive that you already own to the my cloud home, think again. Only one of those will work: from https://support.wdc.com/knowledgebase/answer.aspx?ID=18256&lang=en#subject1 ) BrandProduct Model Western DigitalMy Passport Western DigitalMy Passport Western DigitalMy Passport Essential Western DigitalMy Passport Ultra Western DigitalMy Passport Ultra Metal Western DigitalWD Elements Western DigitalMy Book Western DigitalMy Book Western DigitalMy Book Duo Western DigitalMy Book Studio Western DigitalMy Passport Wireless Pro (DAS MODE) Western DigitalMy Passport Wireless (DAS MODE) SanDiskSanDisk Extreme 500 portable SSD SeagateSeagate Backup Plus SeagateSeagate Backup Plus Fast SeagateSeagate Backup Plus Slim for MAC SeagateSeagate Backup Plus Slim SeagateSeagate Expansion SeagateMiniSataion Safe ToshibaToshiba USB 3.0 Hard Drive ?I am very disappointed by such a limitation, and none of the specs specifies this. Now I have to either wait hours for 2 Tb of data to transfer over wifi instead of USB3, or return the product and find another solution. Rated 1 out of 5 by Jon from A SERIOUS DOWNGRADE from the older WD My Cloud 4TB NAS I have owned many WD products and loved them all. That's why I purchased this product. Never in my wildest imagination could I have imagined WD producing a product that is such total junk. 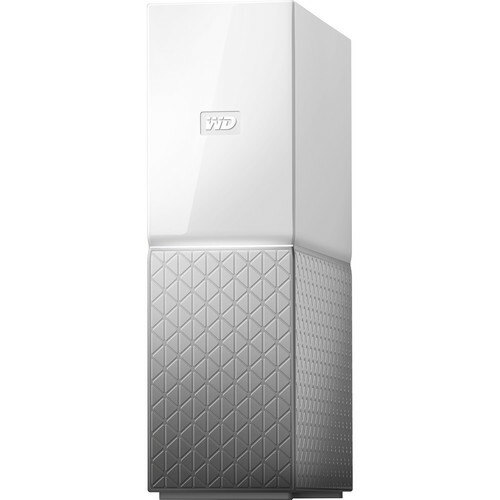 I own a WD My Cloud 6TB that I use to do my Mac TimeMachine backups and cache local files. I purchased this device to serve as a portable companion to that device, for when I am on the road and need mass storage and backups. This device is is NOT that! It is simply a "share all my files with the world" over the Internet and does not support any of the NAS features that made the old My Cloud device such an excellent personal NAS system. The worst thing about the device (besides not being user configurable or managed) is that you can't even use it on an isolated LAN. It HAS to have Internet connectivity to even function! You can't carry it with you and use it for backups when you don't have internet. To me, the device is utterly worthless, and I am sending it back. Rated 1 out of 5 by Linda from Nothing like my old MyCloud The My Cloud Home has virtually NONE of the features that my old My Cloud had and were useful. There is no way to persistently share individual files, folders, or anything outside of the Family folder. There is no user management functionality to speak of. Sharing is accomplished only through URL links. I wish that I would have known these things before purchasing this device. It has been frustrating and very disappointing. Rated 5 out of 5 by Gailen from Great Hard-Drive for Ethernet Connection Good price for capacity. Once set-up, works flawlessly. Set-up documentation does not properly address Mac / Apple environment - must search through WD Knowledge Base to learn how to connect Apple Time Machine using the "Guest" user. Also, mapping My Cloud Home NAS Hard-Drive to Finder in Mac OS can only be completed through the WD Discover App on Mac. Rated 4 out of 5 by Paul from So far so good One of my computers died and I needed something to put my music on for my Sonos system. This worked very well and I have so much room left over, I am storing photos on it. Rated 3 out of 5 by Brock from Not a real NAS Does what I need: Cloud Storage and Plex internal support. Can it be used for Time Machine for mac? Yes, the WD My Cloud Home 4TB 1-Bay Personal Cloud NAS Server (1 x 4TB) B&amp;H # WEBVXC0040HW is compatible with Time Machine. Is the WD Mycloud 4TB NAS Server plug and play on a Mac? I am not sure if I am answering your question. You dont attach it to the computer. You attach it to the wifi router. Answered by: Htet Nay Lin O.